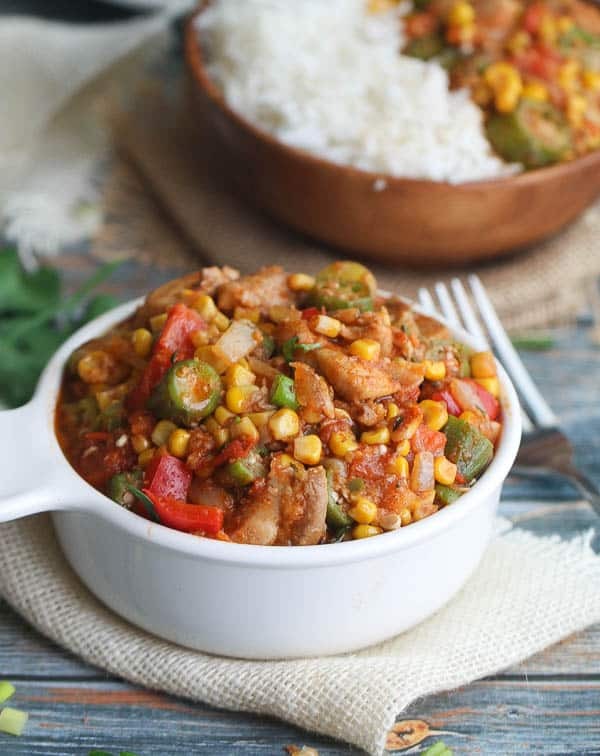 Creole Chicken Okra: Hearty, Healthy and Filling with tons of vegetables ,spice and comes together quickly- A great weeknight meal, Vegan or Not. I know Okra can have a reputation for being a slimy vegetable- it has many fans and lots of haters too. I distinctly have memories from my childhood, coming up with every excuse in the book to avoid eating it. Always hoping it would excuse me from the table- Never Did! In my household, back in Africa, summer breaks were the only times we did not have sit down meal, on weekdays. And okra soup was only cooked on weekdays. So you know what happened to my okra when there was no parental supervision, right? Today, my relationship with okra is not the same, it has evolved, and getting older means you do have to eat your vegetables. Yes! Even when no one is watching. In most West African Countries – it is consumed most likely as a soup. And referred to as okro soup. Here is the creole version, enjoyed here in the U.S, mostly in the South. 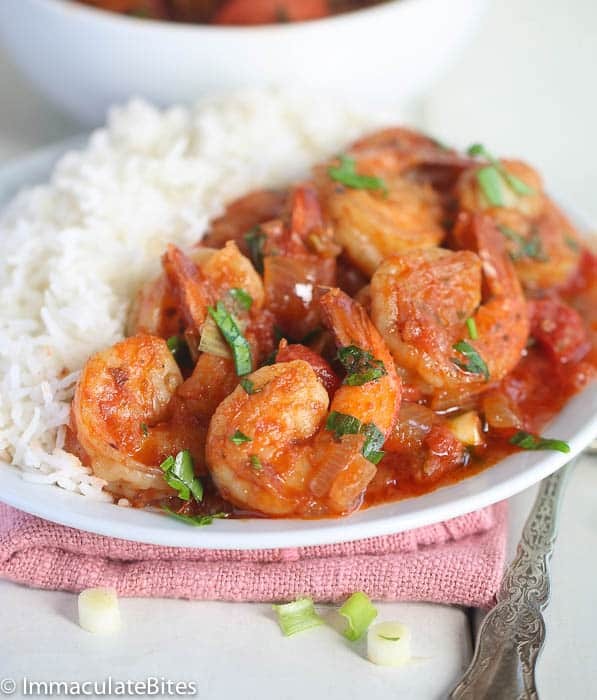 This dish is infused with this flavor-packed Creole Seasoning. 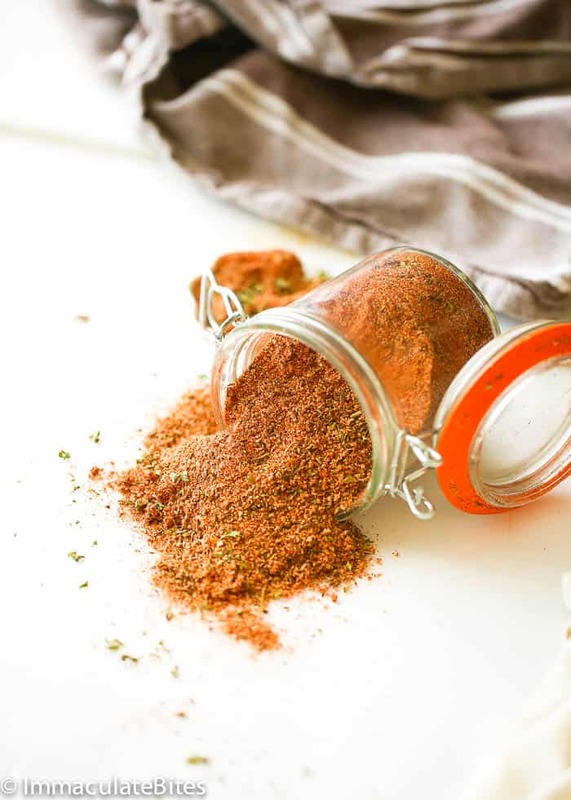 You may have the store-bought ones but I’d say nothing beats this homemade version of creole seasoning. It has more depth in flavor as it can be easily to customized to your own persona reference. 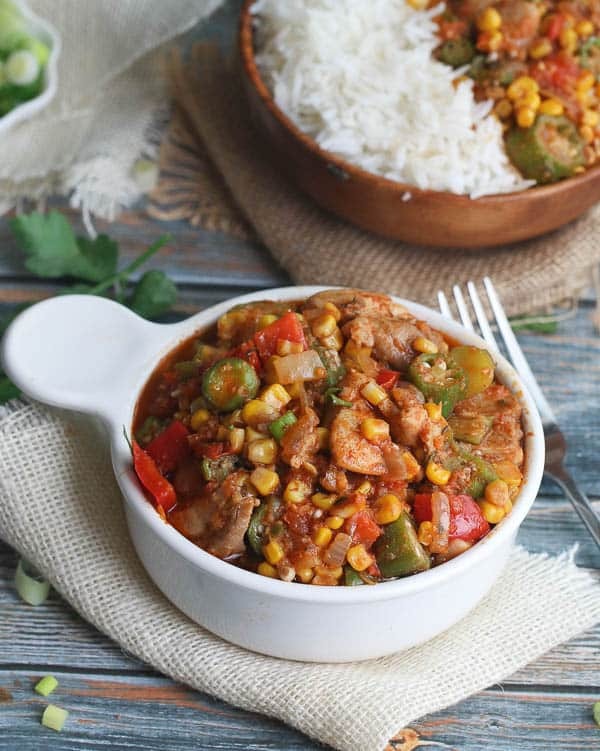 Can you believe okra is on the menu now in my own household? Still a picky eater when it comes to okra. But the benefits outweigh the cons for me. It is low in calories, rich in vitamin C and a good source of foliate , calcium and taste quite good. Plus, I like to switch things up, using a variety of ingredients and have come to appreciate it for what it is. 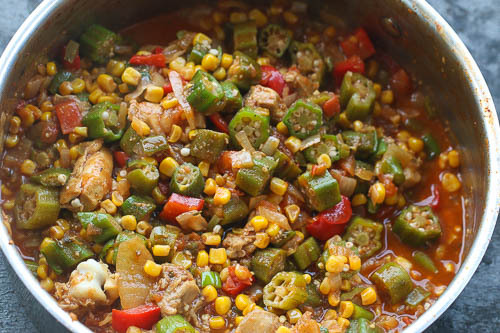 This Creole Okra is one I would definitely have swallowed, without blinking an eye. If you want to give this vegetable a try this is. This is it! 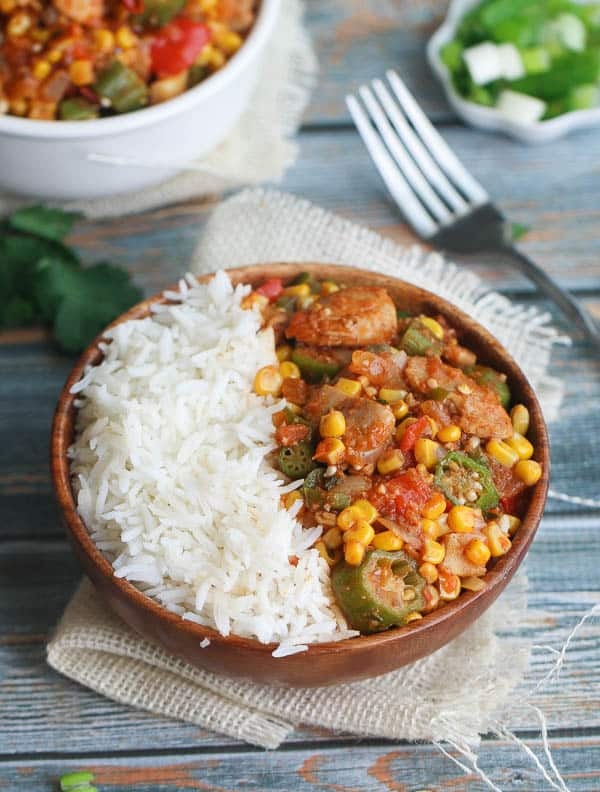 It combines the bounty of a summer vegetables — corn, okra, tomatoes peppers and infused with creole spices. It comes together quickly without over cooking- you would hardly notice any slime. It’s always great served with rice on a plate, can be made completely vegan without the chicken and it is still hearty and filling. 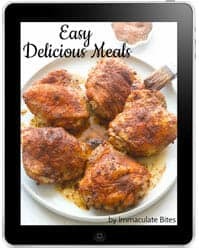 Cut chicken into bite size pieces, and then season with creole spices or salt. Heat a saucepan with about 1 tablespoon of oil. 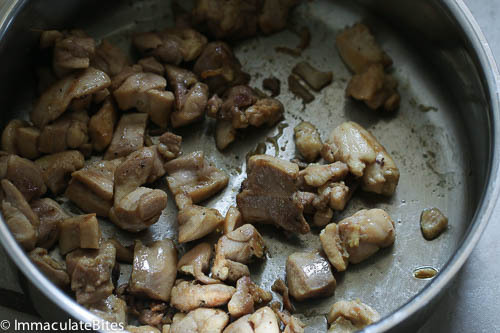 Add chicken and sauté for about 5 minutes or more. 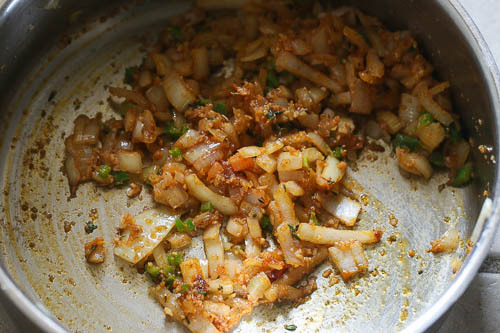 Remove and set aside on a plate Throw in onions, garlic, jalapeno, bay leaf, thyme and paprika, add 2 tablespoon oil or as need, then sauté for about 2 -3 minutes. 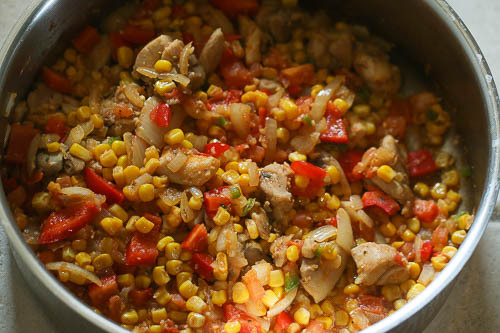 Then add tomatoes, cayenne, corn, bell pepper, cayenne pepper chicken and paprika, cook for about 5 minutes. Serve with my rice and corn bread. If using a bag of frozen okra, do you thaw it first? No you do not have to thaw it first. I did this for lunch today. Okra is one of my favorite vegetables. I sometimes just steam the little ones whole and add to salad. Glad you like it! I love okra, too. I’ve been trying to expand my culinary horizons. Purchased gorgeous red okra at our local Farmers Market. Ran across this recipe. It is amazing!!! I added leftover turkey breast (from Sunday’s dinner instead of the chicken) and Creole sausage (from our local sausage maker). I also took your suggestion and made your Creole seasoning instead of purchasing ready-made. I added some celery for texture and because I had it on hand. I’m sorry I did not take a picture. My husband and I were too busy making yummy noises. Served over brown rice with bread. Not only is it a beautiful presentation — it’s soooo healthy and delicious, too. Thank you so much for this great recipe!! Definitely a keeper. Thank you for taking the time to let me know, Patricia. I’m so happy you did make the homemade creole seasoning, it’s much better than store bought. 😉 Can’t wait for you to explore some of my recipes. Tried this recipe last night and loved it! Thank you. I’ll be making it again….and again! Yaaay! Glad you love it, Been. 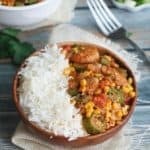 While I see your recipe for the homemade version of Creole Seasoning, I do not see where the Creole Okra recipe actually calls for the seasoning in the list of ingredients. Is this an oversight on my part? I should point out that I made the dish by the recipe instructions and it is packed with flavor. Even my wife, who doesn’t care for okra, enjoyed the dish. I LOVE making this recipe. It never fails!! Glad it always turns out good for you, Rae! Thanks for stopping by. I made this as a vegan dish in my instant pot. It was delicious. Hi, would you kindly add me to your email list. Thank you. Hello! When you say to season the chicken with Creole seasoning or salt, what do you mean exactly? I see Cajun seasoning advertised on your site. Do you mean something like that? I’m not sure what you mean by Creole seasoning. Thanks! Your recipes always look delicious! 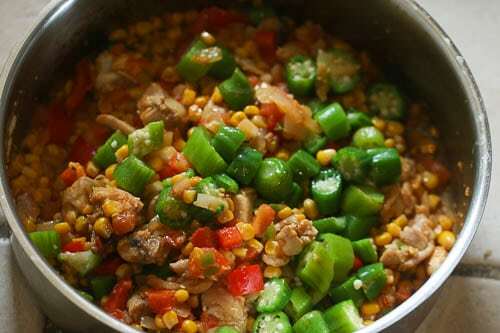 Grew up on this….. Okra on a pan in the oven, grease the flat pan spread okra onto pan 350 to 400 degrees adding a little vinegar flip the okra occasionally slim disappear s. Dried shrimp soaked in water for stock…Bon appetite !!! Bon Appetite Caprisha!!! Thanks for taking the time share . Will definitely give this a try. Thank you I am enjoying as we speak!!! Almost forgot blue crab!!! Full moon the crabs are full..
I’m making some black eyed peas with ham hocks and was looking for a good southern vegetable side dish. This looks incredible and I can’t wait to try it! Thanks! Hi Teressa! Recipe updated, it’s 2 cups. Thanks! Please let me know how you like it! Hello before I make this Please explain it says 2 or more chicken broth or water. Is this 2 teaspoons, 2 tablespoons, or 2 cups? Definitely looks heavenly. Thank U for sharing your recipes with us. Okra is actually quite a common ingredient in Japanese cooking. Well, not so much IN, but it is a common side. 🙂 I love the sliminess personally! I don’t know many other things to make with it so thank you for the inspiration! I actually spied okra at the veg shop yesterday for very good value, I might have to go back and get some!! Awesome! You are one of kind- Nagi. I can believe you enjoy the sliminess.